I've been logging the football games that I've been to since the 1992-93 season. It was my first year at VI Form College and I got into going to football in a big way. I was helped by my Dad being a keen fan of football and got the opportunity to visit a number of grounds near to where we lived in Shrewsbury. 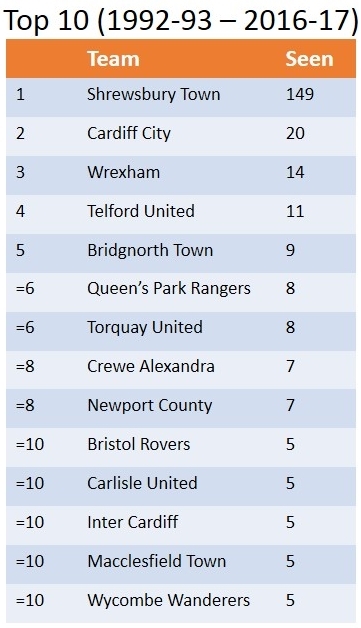 I saw 29 games that season, mainly Shrewsbury Town, but also games at Wrexham, Telford, Bridgnorth, Crewe, Walsall, and strangely, Cardiff City's Ninian Park. Little did I know that I would end up living barely a 20 minute walk away from that now-demolished stadium for a good chunk of my adult life. 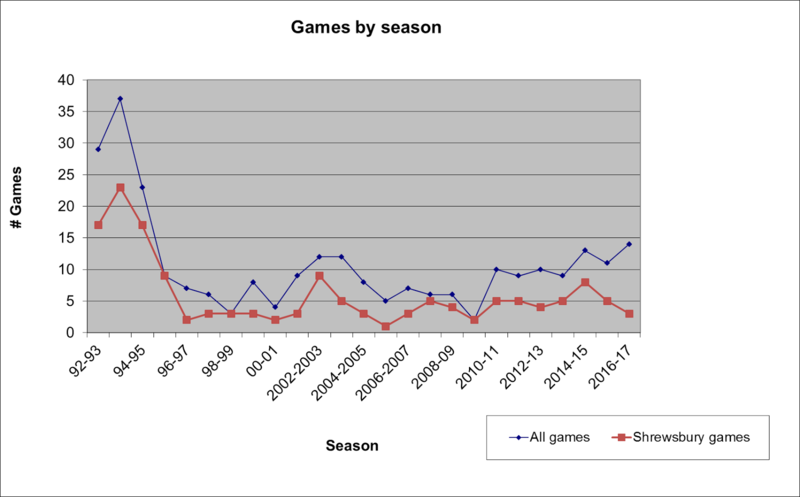 Here's a graph of my game attendance from 1992-93 through to the 2016-17 season. The blue line marks all the games I went to in a given season. The red line is the number of Shrewsbury games as a subset of that total. There are three seasons when I was a one club man, but most years I've been to a few more games. For most of the noughties the other games were Wales Internationals, but there have been others. Recently, thanks to my friend Steve, I've been to quite a few QPR games and some Poole Town games as well. And my friend Sara, a season ticket holder at Cardiff City has helped me catch several games at the new CCFC Stadium, built opposite where Ninian Park used to be. My record high point of 37 in 1993-94 is probably going to stand for all time. I joke that year was BC - Before Cathy. But it was also a year when I possibly should have spent more time concentrating on my A-levels, rather than going to football matches. Ah, the freedom of youth! And I had my Dad seeking out more games for us to go to when Shrewsbury weren't at home. That's how I went to a Shifnal Town game. I still like going to football matches with my Dad. Last week we froze in the permanent temporary marquee that is the away end at Bristol Rovers. Shrewsbury's late winner warmed us up a bit. In this 25 year span, I saw Shrewsbury 149 times, and a total of 269 football matches. These are small beer compared to the numbers racked up by serious groundhoppers, but still a lot more than many people manage. The average is dragged down by seasons like 2009-2010 when I only went to two games. I have seen at least one Shrewsbury game every season, literally just the one in 2005-2006. In the process I have visited 59 different football grounds, ranging from Elgin to Plymouth, Norwich to Newtown, and including a MLS game in Salt Lake City. Several of the grounds have disappeared. Ninian Park, obviously, the Gay Meadow, which I loved and can picture clearly in my mind's eye even after ten years in the new stadium, the frankly horrible Vetch Field, and even the original Wembley. In total, I have seen 148 different club sides. I expected it to be higher given the number of games, but I have seen some clubs a surprising number of times, and I'm not counting International or Representative teams. Some of the teams I've seen no longer exist, disappearing through mergers or just going bust. A number have reformed lower down the league. I am counting Wimbledon prior to the move to Milton Keynes and AFC Wimbledon, founded by fans in protest, as the same club. It's my list; my rules. As you'd expect, Shrewsbury lead the way. I'd been to more Cardiff matches than I thought when I totted them up. I haven't seen Bridgnorth play since 1994-95, but I did see them 9 times over three seasons in the 90s. Torquay place quite highly, thanks to the influence of Cathy's cousin, Adam, who supports them. Inter Cardiff won't be improving on their position. They disappeared in a merger with UWIC several years ago. UWIC then evolved into Cardiff Metropolitan. I have seen Cardiff Met play, but it's not the same club at all. The top ten will change next year. 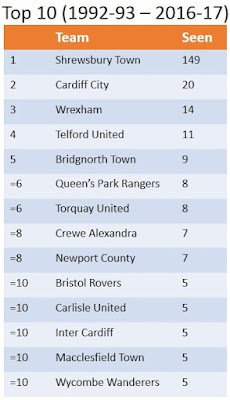 I've already seen QPR lose narrowly at Cardiff this season, so they will move up to joint 5th. And I've mentioned how I've seen Bristol Rovers again, so they will be on their own in 10th. In 2016-17 I went to the highest number of games for 20 years (14), but that was a precursor to a real renaissance in matchgoing this season. The game at Bristol's Memorial Stadium last Saturday was my 20th of the season so far. I have plans to see Shrewsbury again on my birthday and they are also one game away from another Wembley appearance in the football league trophy, which I will really want to go to. If they get to Wembley it will be the fourth time I have seen them play there. They've lost all three previous games, so they are due a win. I feel I am due a win too.